In the year 533 the Emperor Justinian reformed legal education in the Eastern Roman Empire, proscribing a new five-year course of study. The Institutes was published to serve as textbook for first-year law students, a position which it maintained for centuries. Institutiones [with the Novels and Tres Libri]. Manuscript, southern France, circa 1250. In this large 13th century manuscript one can see a number of design features that became commonplace in legal publishing. Color titles, wide margins for notetaking, text in columns in the middle of the page surrounded by commentary, called gloss – itself a product of legal education – are all features that would carry over from the manuscript era into print. Institutiones iuris civilis. Venice: Giunta, 1581. This print edition of the Institutes is open to the same page – the beginning of Book Four – as the large manuscript copy. Published over 200 years after the manuscript copy, we can see many of the same features. The text is in middle of the page, surrounded by the gloss. The sections are still marked in red, while the hand drawn embellishments in the manuscript edition have been replaced by decorative woodcuts. Institutiones imperiales. Paris:Jean Petit, 1510. This truly pocket-sized copy of the Institutes would have been attractive for the student who needed a textbook that was both inexpensive and easily portable. Its minute size, however, did not stop its owner from making extensive use of the margins for notes. This is the only known copy of this edition. Johann Friedrich Böckelmann. Compendium Institutionum Caes. Justiniani. Leiden: Felix López de Haro, 1681. This abbreviated copy of the Institutes appeals directly to students. The illustration shows two paths available to the prospective student: in the path on the right – “either slowly or never” – a student struggles up a steep hill with a cumbersome basket full of books on their back. On the path on the left – “neither slowly, nor with difficulty” – the student proceeds along a series of well-defined steps with only a single book – this book – in hand. Bartolomé Cartagena. Synopsis juris civilis. Cologne: Wilhelm Metternich, 1719. This small volume of Roman law presents the most important parts of the Institutes as a series of easy-to-understand questions and answers – a format that proved popular for legal study guides. 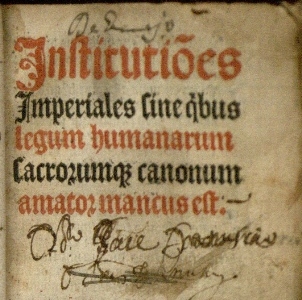 Imperatoris Iustiniani Institutionum libri IIII. Passau, 1700. An engraving of Justice adorns this small copy of the Institutes.